This post is sponsored by PopSecret. I was provided with compensation for this post, however, all content herein is original, honest and 100% mine. Pinky promise. In a home with three active boys, you better believe we do our fair share of fort building! Who doesn’t love a good fort?! I’ve got about 3 years of fairly regular practice in building forts and my skills have definitely come a long way. But, my favorite thing about building forts with my kids is not the huge pile of blankets and pillows, precariously draped on, behind, over and from sometimes questionable surfaces. It’s what happens in that huge pile and the interaction we get to have with each other. It was while building forts that I realized what a huge imagination Little J has! I love to see my boys piece the puzzles together and come up with a great fort. And there’s something about being in a fort that encourages kids to open up. I love that! And what makes forts even better? Awesome snacks, of course. I have three boys. And a husband. They eat A LOT. And they love to snack. You can bet we have multiple popcorn boxes stashed away in the cupboards because we are definitely popcorn people. At least three or four times a week we are popping away those corn kernels. We love to try different seasonings and toppings. We’ve found our favorites through years of sampling, testing and trying out different combinations. PopSecret makes it easy to satisfy our desire for flavor diversity. There are many different kinds to choose from, including cheddar and caramel! And you can’t ask for an easier or faster snack. All you have to do is stick it in the microwave. Big J can do that! After about 20 seconds of active prep time and just a couple of minutes later, you’re ready to go with your delicious treat. Engaging in quality with my kids is important to me. 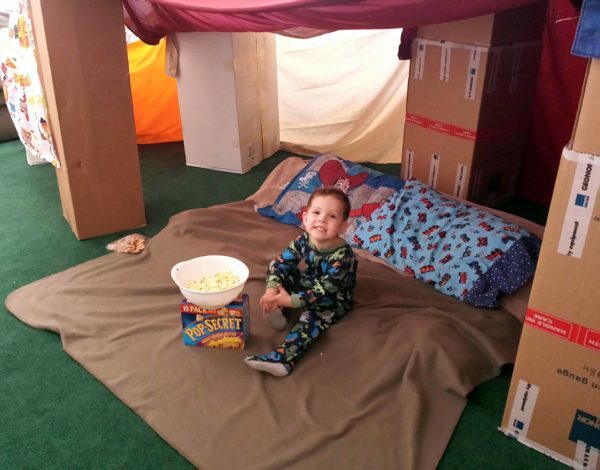 We often share a bag of popcorn inside a fort, as it is definitely one of our go-to activities when we are stuck inside, whether it’s the winter chill or the summer heat that keeps us from enjoying the outdoors. 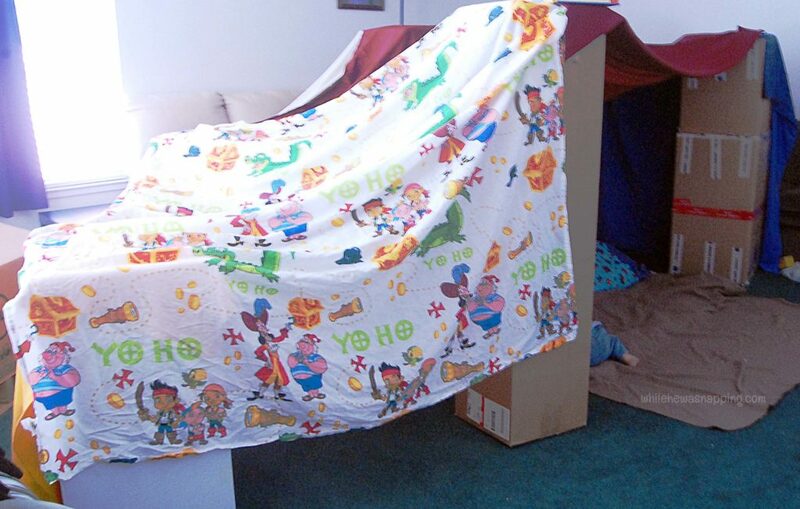 Building forts is a great way to release some of that built up energy in a constructive and beneficial way. It’s much preferred to the destruction and bickering that almost never sometimes, okay, often occurs when we’re out of ideas and stuck inside. The best thing about building forts is that you almost always build something different than the last time and that keeps it fun and exciting to little ones with an attention span of 2.1 seconds. Last time it was a space ship, this time it’s a pirate cave and we’re digging for treasure! After perfecting my technique for the past three years, I thought I would take a minute and let you in on my essentials for building forts so you end up with a fabulous masterpiece… and how to get them to last more than 15 minutes with the kids tearing through them. – Blankets. Obviously, right? But, not all blankets are created equal and not all blankets perform equally either. Large, thick blankets like comforters or quilts work best to create the walls of your fort. 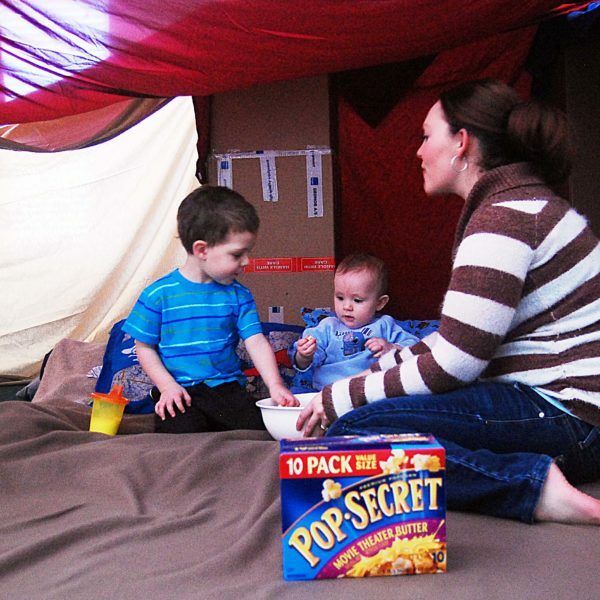 They will help give your fort a little stability when the kids fall over on the blankets or pull on them. Flat sheets work fantastically for the roof when building forts. They are light-weight and won’t sag as badly as a heavier blanket. And, bonus, they won’t crush your children if your fort caves in. – Safety Pins and Clothes Pins. Your fort will last longer if you take the time to secure it. It’s less likely your kids can pull down a 20-foot-square, ginormous blanket than a bunch of three or four-foot blankets. I started off using clothes pins, but they can (and will) snap or pop off or the blankets will get pulled out of them. These are the safer method for preserving the state of your blankets though. Safety pins are now my preferred method of securing a fort. They are much more durable, but the possibility of a little hole getting torn in your blanket is more likely than with clothes pins as the kids tug on the blankets. 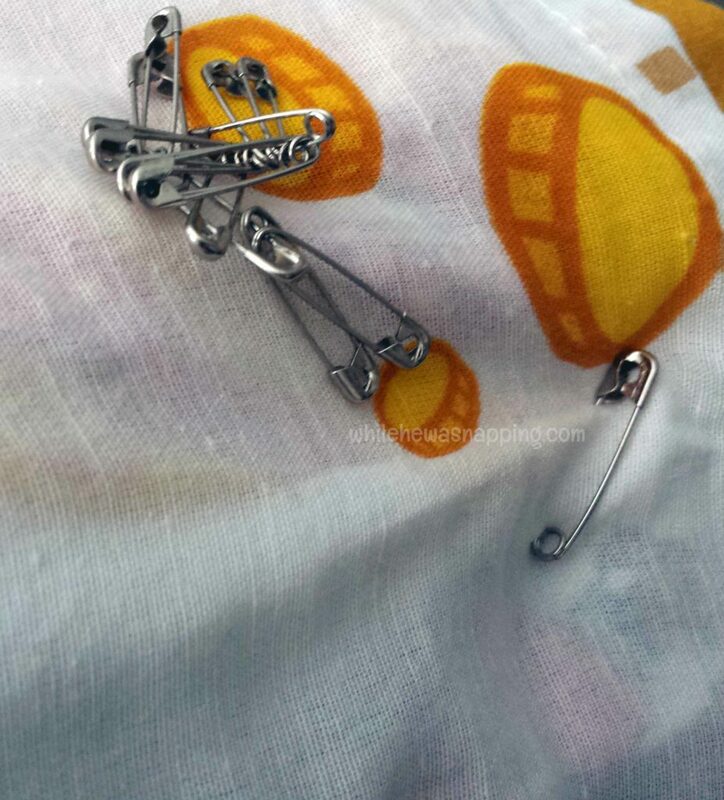 I switched to safety pins when I got tired of my kids seeing how hard they had to pull on the blankets to pop the clothes pins off. Hooligans. – Supports. These can be almost anything: chairs, tables, couches, counters, boxes, couch cushions, the piano, your antique china hutch. Uhh, okay, maybe not the last one or two… you should probably lay those rules down from the start. Get creative! This is one of my favorite parts of building forts. And there is NO wrong answer, except for that china hutch. The piano bench makes a great “secret entrance”, couch cushions make kid-size tunnels when you lean two of them together, and tables are a perfect spot for all the blankets to overlap because it helps support all those edges. Safety pin those babies together and they aren’t going anywhere! 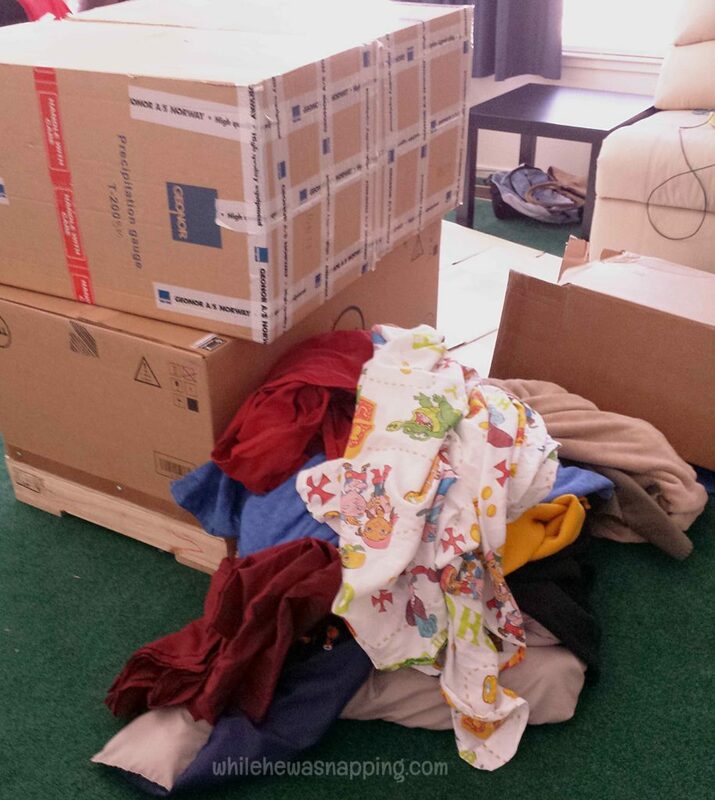 This fort used large boxes that Mr. Napping brought home from work. – Pillows. I have to remind my boys that you don’t have to constantly be running through the fort like a maze. You can, in fact, just sit in it. Pillows and their favorite blankets help maintain a fleeting and (very) superficial sense of calm in our forts. It doesn’t hurt to set it up so they can see the TV too. – Lights. These are not actually necessary, but they are fun. A string of Christmas lights just adds to the magic. And if your kiddo doesn’t like the dark, it’s the perfect solution. My boys also like flashlights so they can “explore”. – Snack Box. This would be my boys’ favorite part of building forts. In order to have evidence of my hard work for longer than a quarter hour, I usually bribe my little tornados with a fort-nic… fort picnic, right? There is almost always popcorn in their picnic basket. Building forts is a great way to spend some quality family time together. You get to create, problem-solve, and just talk. It appeals to the kid in all of us and it can be a great stress reliever to just stop and play. Those are the days I’m being the mom I want to be, the mom I want my kids to remember. 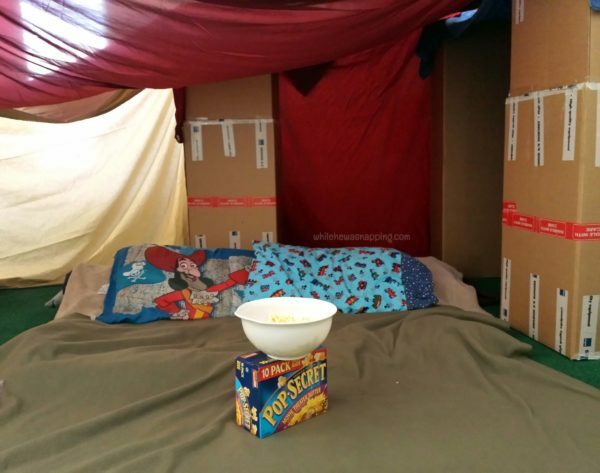 You can post your fort photos to PopSecret’s Facebook page, tagged with #PopSecretForts, and you just might get a little prize package. 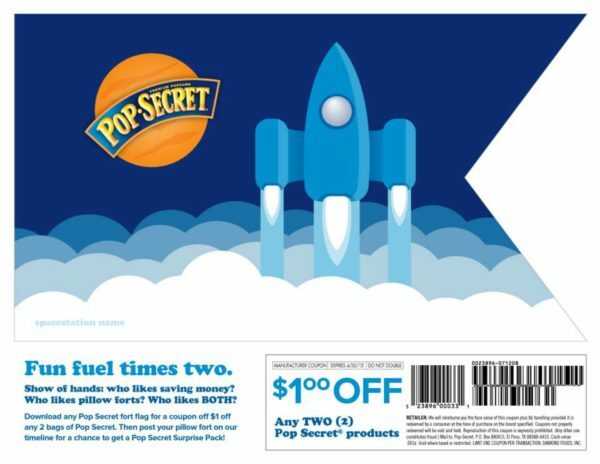 While you’re there make sure to grab the $1.00 off coupon to make that popcorn even more delicious. They also have some pretty awesome flags you can print to finish off your awesome fort! Do you have any tips for building great forts? This one had a big open side (so they could see the TV and watch a movie in their fort) that made it pretty easy to get into. Some of the smaller, more enclosed forts are less mommy-friendly and I leave those ones for the kiddos. =) But I hope they will remember that some times Mommy did stop and play too. And if they don’t, I have pictures to prove it, right!? =) Thanks for stopping by!